Hephaestus was the Greek god of technology, blacksmiths, craftsmen, artisans, sculptors, metals, metallurgy, fire and volcanoes. Hephaestus' Roman equivalent was Vulcan. In Greek mythology, Hephaestus was the son of Zeus and Hera, the King and Queen of the Gods. As a smithing god, Hephaestus made all the weapons of the gods in Olympus. He served as the blacksmith of the gods, and was worshipped in the manufacturing and industrial centres of Greece, particularly Athens. The cult of Haphaestus was based in Lemnos. Hephaestus's symbols are a smith's hammer, anvil, and a pair of tongs. 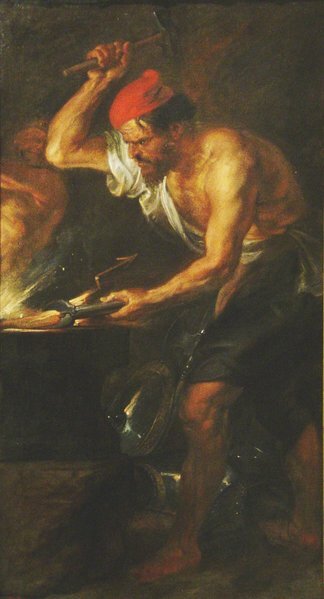 Though his forge traditionally lay in the heart of Lemnos, Hephaestus was quickly identified by Greek colonists in southern Italy with the volcano gods Adranus of Mount Etna and Vulcanus of the Lipara islands, and his forge moved here by the poets. The first-century sage Apollonius of Tyana is said to have observed, "there are many other mountains all over the earth that are on fire, and yet we should never be done with it if we assigned to them giants and gods like Hephaestus" (Life of Apollonius of Tyana, book v.16). Hephaestus and his brother Ares were sons of Hera, with or without the cooperation of Zeus. In classic and late interpretations, Hera bore him alone, in jealousy for Zeus's solo birth of Athena, but as Hera is older than Zeus in terms of human history, the myth may be an inversion. Indeed, in some versions of Athena's birth, the goddess only enters the world after Zeus' head is split open by a hammer-wielding Hephaestus. Either way, in Greek thought, the fates of the goddess of wisdom and war (Athena) and the god of the forge that makes the weapons of war were linked. In Attica, Hephaestus and Athena Ergane (Athena as patroness of craftsmen and artisans), were honored at a festival called Chalceia on the 30th day of Pyanepsion. Hephaestus crafted much of Athena's weaponry, along with those of the rest of the gods and even of a few mortals who received their special favor. An Athenian founding myth tells that Athena refused a union with Hephaestus, and that when he tried to force her she disappeared from the bed, and Hephaestus ejaculated on the earth, impregnating Gaia, who subsequently gave birth to Erichthonius of Athens; then the surrogate mother gave the child to Athena to foster, guarded by a serpent. Hyginus made an etymology of strife (Eri-) between Athena and Hephaestus and the Earth-child (chthonios). Some readers may have the sense that an earlier, non-virginal Athena is disguised in a convoluted re-making of the myth-element. 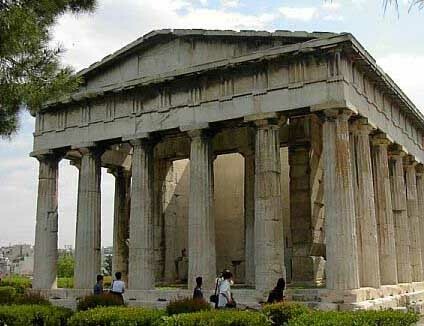 At any rate, there is a Temple of Hephaestus (Hephaesteum or the so-called "Theseum") located near the Athens agora, or marketplace. located at near the Athens agora, or marketplace. Hephaestus also crafted much of the other magnficent equipage of the gods, and almost any finely-wrought metalwork imbued with powers that appears in Greek myth is said to have been forged by Hephaestus: Hermes's winged helmet and sandals, the Aegis breastplate, Aphrodite's famed girdle, Achilles's armor, Heracles's bronze clappers, Helios's chariot, the shoulder of Pelops, Eros's bow and arrows and Hades's helmet of invisibility. Hephaestus worked with the help of the chthonic Cyclopes, his assistants in the forge. He also built automatons of metal to work for him. He gave to blinded Orion his apprentice Cedalion as a guide. Prometheus stole the fire that he gave to man from Hephaestus' forge. Hephaestus also created the gift that the gods gave man, the woman Pandora and her famous box. In Rubens' gritty Vulcan [Hephaestus] forging the thunderbolts of Jove, only the title is mythic in an essay in realism illuminated by the firelight of the forge.In Iliad i.590, Zeus threw Hephaestus from Olympus because he released his mother Hera who was suspended by a golden chain between earth and sky, after an argument she had with Zeus. Hephaestus fell for nine days and nights before landing on the island of Lemnos where he grew to be a master craftsman and was allowed back into Olympus when his ability and usefulness became known to the gods.Hephaestus was quite ugly; he was crippled and misshapen at birth: in the vase-paintings, his feet are sometimes back-to-front. In art, Hephaestus was shown lame and bent over his anvil. He walked with the aid of a stick. 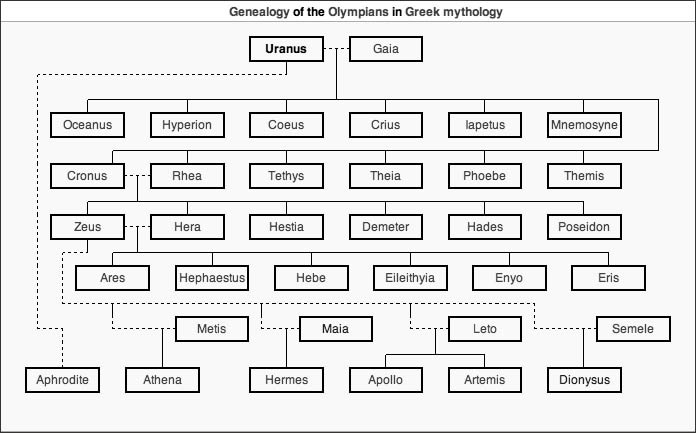 Hera, mortified to have brought forth such grotesque offspring, promptly threw him from Mount Olympus. He fell, as he tells it himself in the Iliad (xviii.395) many days and nights and landed in the Ocean where he was brought up by the Oceanids Thetis (mother of Achilles) and Eurynome. (HephaetusÕs physical appearance indicates Arsenicosis, low levels of arsenic poisoning result in lameness and skin cancers. Arsenic was added to bronze to harden it and most smiths of the Bronze Age would have suffered from chronic workplace poisoning). Hephaestus gained revenge against Hera for rejecting him by making her a magical golden throne which, when she sat on it, didn't allow her to leave it. The other gods begged Hephaestus to return to Olympus to let her go but he repeatedly refused. 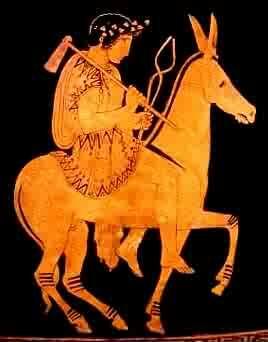 Dionysus got him drunk and took him back to Olympus on the back of a mule. Hephaestus released Hera after being given Aphrodite, the goddess of love, as his wife. In the Olympian order, Hephaestus was formally paired with Aphrodite, whom no one could possess. Although married to Hephaestus, Aphrodite gave herself in secret to Ares, according to a tale in the Odyssey. 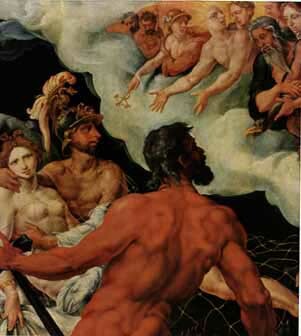 When Hephaestus found out about it from Helios, the Sun, who sees all, he surprised them during one of their trysts ensnared in his invisibly fine and unbreakable net and left them exposed for all of Olympus to see. The Thebans told that the union with Ares produced Harmonia, as lovely as a second Aphrodite. But of her union with Hephaestus, there was no issue, unless Virgil was serious when he said that Eros was their child (Aeneid i.664). But in Homer's Illiad the consort of Hephaestus is a lesser Aphrodite, Aglaia "the glorious," the youngest of the Graces, and Hesiod agrees. 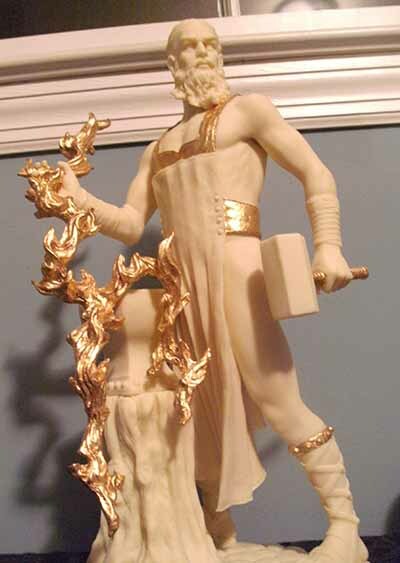 Hephaestus fathered several children with mortals and immortals alike. One of those children was the robber Periphetes. With Thalia, Hephaestus was sometimes considered the father of the Palici. Hephaestus was somehow connected with the archaic, pre-Greek Phrygian and Thracian mystery cult of the Kabeiroi, who were also called the Hephaistoi, "the Hephaestus-men," in Lemnos.